Meet InfoSafe LIVE! - the next generation of our best-selling and award winning InfoSafe secure login and password management software. The web application is an online system, securely accessible from any desktop computer or from any mobile device with a browser, including iPhone, Android, Blackberry, Windows Phone, and many others. Any phone or computer (PC or Mac) with an internet connection can access InfoSafe LIVE! We have gone to great lengths to encrypt, securely store, and protect your private data with this app. 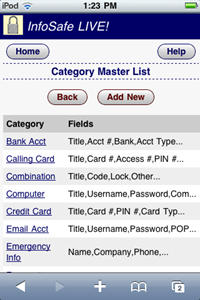 You now keep track and organize usernames, passwords, website logins, ID numbers, serial numbers, software codes, insurance info, bank accounts, credit cards, calling cards and much more right in the palm of your hand! Includes 128 bit AES encryption, password protection, secure servers, and additional PIN locking. All of this for less than $1 per month. Your subscription is secured by your username and password, and accessed from our secure server. This allows you to access your InfoSafe LIVE! information from any desktop computer or any mobile phone quickly and easily. 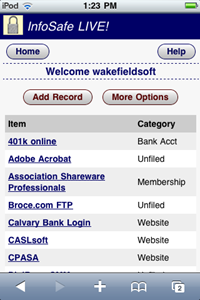 You may register for a WakefieldSoft LIVE! account and do a 14 day trial of InfoSafe LIVE! You can purchase a full subscription at any time during or after the trial period. Create an account and get a 14 day free trial here: WakefieldSoft LIVE! After purchasing, you will be immediately provided with an activation code. After your create a WakefieldSoft LIVE! account, enter the activation code and order number to activate your subscription. If you used a free trial first, and purchased from your WakefieldSoft LIVE! account, the subscription should be automatically activated. All purchases are done securely by our ecommerce provider Paypal. If you have not purchased from us or Paypal before, you will need to register for a new account during the checkout process. This is separate from your WakefieldSoft LIVE! account registration. Thank you.